Alba offer and extensive array of Self Supported Extension Ladder to all our potential clients. 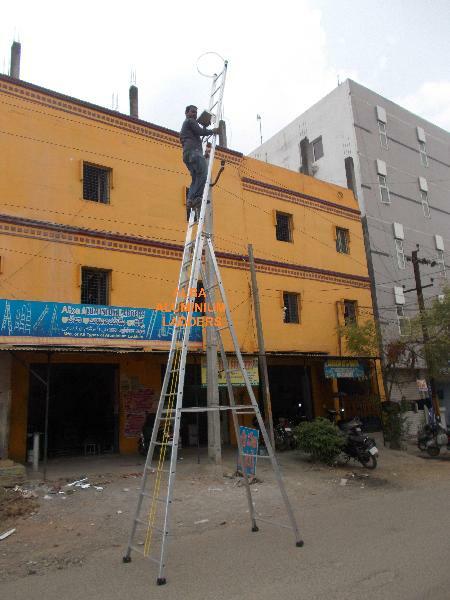 Our ladders are highly durable and the raw materials used for it are sourced from the reliable vendors in the market, High quality aluminum along with advanced technology is the main secret behind our robust quality products, Aluminium Self Supporting Extension Ladder provides you with extra comfort with its non-slippery corrugated steps. These ladders are used where no wall support is available or where structural abstractions prevent use of ordinary lean to ladders. These ladders are equipped with manila ropes, pulley, safety locks, solid rubber to avoid surface scratching.These are basically used in large buildings, bungalows, hotels and other places. Portability and no maintenance charges are the best features of our product.